Sugar has had a rough couple of days, as have I.
Wednesday afternoon I saw some trembling. Not a good sign when it's above 40 degrees. 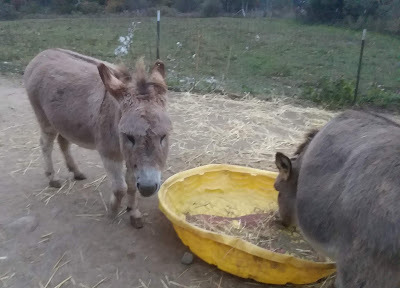 Four little donkeys are growing their winter coats and that was not a temp which should bother them. Then she went off her food. Thursday morning -- a call to the vet. Dr. DeWitt was out within an hour. High heart rate, little sound of gut rumbles, bloating. Not a good sign. Could be severe gas, or an impaction. I learned a lot this visit, but I won't go into all the details. (capillary reaction, gut motility, etc) Sug got an injection of pain reliever, then the old tube-up-the-nose with a water/electrolyte solution going down. See how she does. Thursday afternoon she exhibited normal behavior and demeanor. Then Thursday evening the tremors returned but she was nibbling at her food. Friday morning -- call #2 to the vet. Same routine, although the promising signs were a lower heart rate, some gut rumbles, and bloating had decreased. She was hydrated again but was frisky enough to fight the tube. Another good sign. 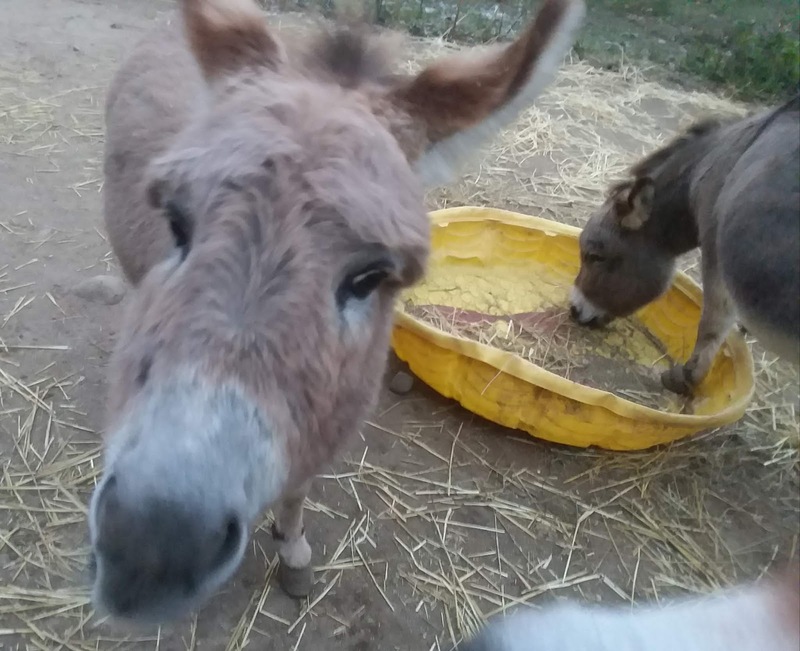 Dr. Sheldon recommended a little serving of soaked hay cubes with lite salt (potassium chloride) every hour and a dose of banamine (the pain reliever) in the evening. She also had to be segregated from the herd so we could see elimination patterns. Sugar hated being cooped up, but felt better when her sister, Spice, kept her company on the other side of the jail bars. This morning (Saturday) I put in a call to the on-call vet. We're not out of the woods yet, but her behavior shows improvement. Gut problems in equines can be fatal, so it's nothing to ignore. One note of humor in this whole thing. I have a nickname for Sugar which I think I've mentioned. "Sugar Booger". Well, vet #2 thought this was her actual name and that's what appeared on my receipt. I had to laugh, and then correct the vet's office records. With you all rooting for her I know she'll keep improving. Definitely not a laughing matter. I hope Sugar is feeling better soon!! Ooh, so sorry about Sugar's tummy problems, hopefully she'll be all better real soon. Oh, I will sure be rooting for her. Bless her heart. "Sugar Booger" is cute. I like the story. Funny how we call them by different names. All four of the goats we have owned answered to "Baby Goat". Thanks Kris. Knock on wood, I think we're over the hump. Oh gosh just catching up with you Janet. So sorry to hear that Sugar has not been well - what a terrible worry for you. Do hope that she has greatly improved and back to her feisty little self. Sending lots of love and best wishes to Sugar (and you). Louise, thank you. Will report in when everything is 100% A-OK.